When searching for a jazz guitar tone, many guitarists will focus on their guitars and amps as the main source of their sound. But, there is often one important sonic ingredient that players ignore when it comes to finding the perfect guitar tone, the strings. Just as there are many styles of jazz, there are many different brands, styles, and gauges of jazz guitar strings that can help you achieve the guitar tone you desire. 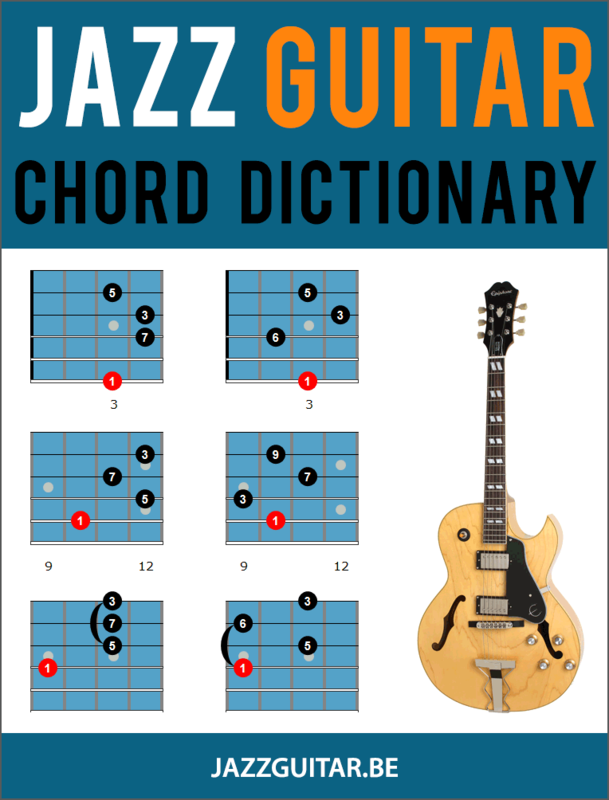 Which electric guitar strings are the best for jazz? While the variety of guitar strings out there today gives players a huge amount of choice, it can also cause confusion and frustration as you search for the right strings for your desired tonal quality. To help you buy the right jazz guitar strings for your sound, we recently surveyed our readers on what strings they use to get a jazz tone. Below are the results of our survey, with background information on the top-5 strings as chosen by our readers. There’s information on string gauge and the results of our question on the eternal debate of flat vs. round-wound strings for jazz. Check out these results, as they might help you narrow down your choice for jazz guitar strings, or they might influence you to branch out and try some new strings. When you’ve looked through the survey, post your favorite strings in the comments section below, or any questions you have about strings for jazz guitar. 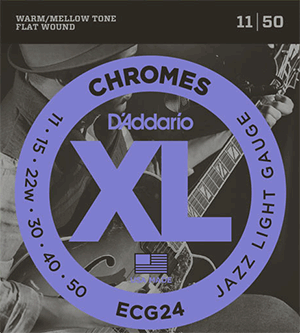 The most popular string set for jazz guitar is the D’addario ECG24 set with string gauges (thickness) ranging from .011 to 0.50 (closely followed by D’addario ECG25, going from .012 to .052). 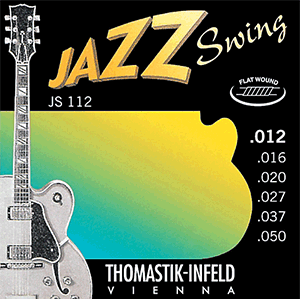 The second most popular jazz guitar string set is the Thomastik JS112 set, with gauges ranging from .012 to 0.50. Guitarists playing on the JS112 set seem to be satisfied with their choice of strings, 0% reported being not satisfied at all. These strings are more than double the price of the D’addarios, but are not the most expensive set in our survey (these are the Thomastik George Benson Flat Wounds further below). Third on the list is the D’addario EXL116 set, with gauges ranging from .011 to 0.52. They are the first round wound set in our survey (number #1 and #2 are flat wounds). The EXL116s are the least expensive set in the survey, you can get more than 7 sets of these for 1 set of the most expensive strings (the Thomastik George Bensons). Price probably comes into the equation when choosing for EXL116s, because the percentage of users reporting not to be satisfied are the highest of our survey. 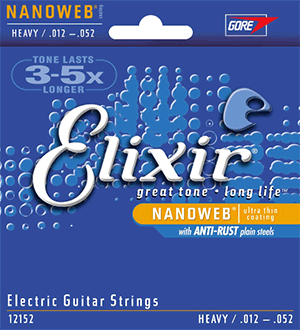 Elixir Nanoweb is a set of nickel-plated steel strings with a nanoweb coating (gauges range from .012 to 0.52). Nanoweb is an ultra-thin coating that keeps dirt out of the space between the windings. The Thomastik GB112 set is the most expensive string set on the list. 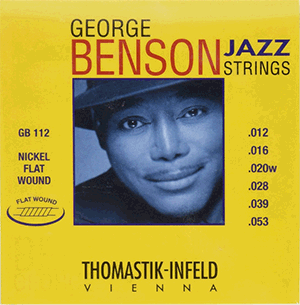 They are designed by Thomastik-Infeld to the specs of George Benson. Gauges go from .012 to .053. 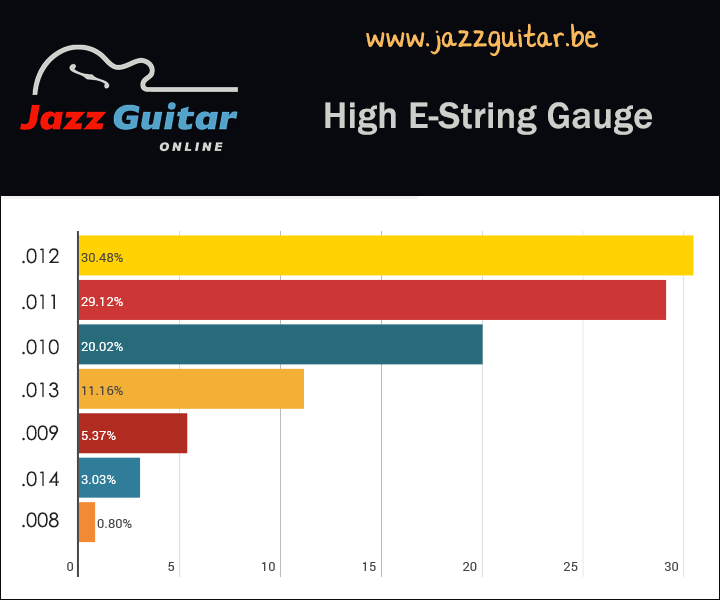 As well as ask our readers about the brand of strings they use, we also asked about the string gauges they prefer when playing jazz guitar. 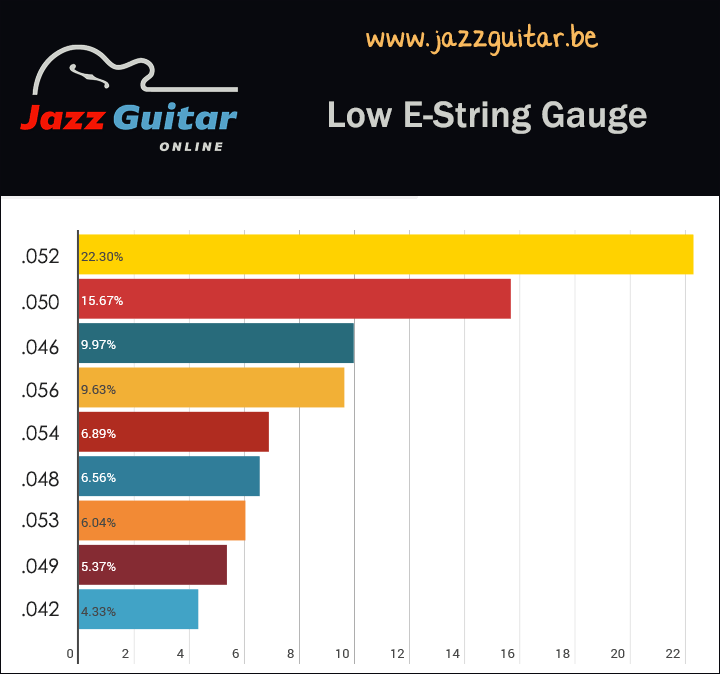 The results speak for themselves; jazz guitarists prefer a thicker low and high-E string, as the thickest gauge string got the most votes from readers. A question as old as jazz guitar itself, or at least as old as these strings were made, players have struggled with which string is better for jazz, round or flat wound? 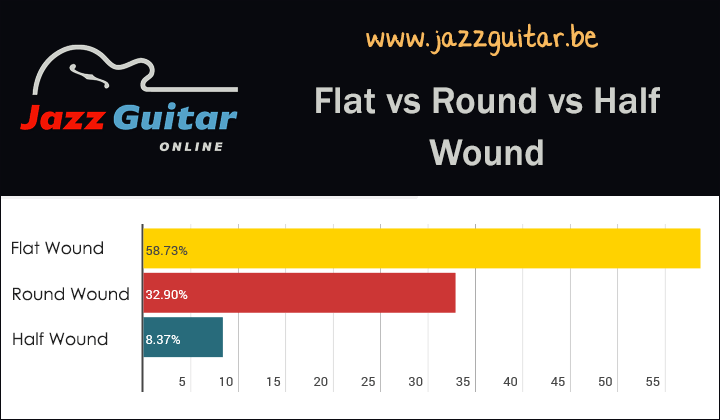 As you can see from the results below, our readers prefer to use flat-wound strings. There are also about 1 in 10 players that prefer half-wound strings, which have started to make inroads into the jazz guitar community in recent years. What type of string do you use? Post your choice in the comments below to see how it compares to our reader’s choices. Half wound or half round? I thought it was half round it has a more responsive core and lasts a lot longer than the ribbon wound strings. They have a better high frequency response also. I think once guitarists have a chance to compare they will make the switch. You’re right, the correct term is “half-round” because they’re round-wound strings that are shaved after being wound, so the inside is still round whereas the playing surface is flat. Best of both worlds. I agree with Tim comments, when i asked few guitarist players around me, very few of them had tried to test half-wound strings, so I suggest to the others to check (At least, one time)these type of strings in the middle, between round wound and flat wound and make themselves the test. Myself, Since this choice, I think the sound of my Golden Eagle Archtop (The Heritage) is brigthness and more polyvalent, if I have to play others tunes than jazz. Interesting survey, the D’addario flat wound chrome are my choice as well. It would be good to get some results from a standardised test conducted by an independent testing organisation. Difficult I realise when you consider players have different requirements for sound as well as touch, but some frequency analysis would at least highlight purity and give some guide as to value for money. Why are some strings twice as expensive as others? Are they twice as good? Thomastik-Infeld is a smaller company than D’Addario, it produces less strings, so the costs are higher per string made. I also imagine they are not as available where they are expensive – where I live, they cost the as the D’Addario Chromes, and I don’t live in Austria. What about guitar types-how does that factor into the equation? Are we talking arch tops or solid body?..or does it matter? Just not interested in flat-wound strings… They sound dead before you even tighten them up. My choice is Thomastik flatwounds 0,13. I tried Thomastic Bensons about 15 years ago and have used them ever since. I used to use 12/53’s on a Super 400 and L5CT but then went to 14/56 Bensons on a Johnny Smith. I restrung the Smith with Pyramid 12/56’s and they take more strength than the Benson 14’s. I will change back to Benson 14’s in future. Also, Thomastics (Bensons) have coated unwound strings so they do not corrode as quickly..the Pyramids had corrosion on first and second strings after being in my case for a week. I have not changed the Bensons on my Super 400 in maybe 5 years and still in good shape…they cost more but sound better and last longer. I have to say I like both “round-wound” and “flat-wound” stings, its all a matter of taste, feel, and the sound you want to hear coming from your axe. There’s really no better or worst-its all good! I have “round-wounds” on an Eastman AR503 and the guitar sounds great. Sometimes Arch-Tops and Hollow bodies are warmer (some may say duller) sounding than semi-hollows and solid bodies and a roundwound string can add just a little brightness and bring out your sound. But, I have flatwounds on my PRS Zack Myers Semi-hollow and boy does it sound great too. My Jazz teacher loves playing my PRS-for Jazz and I’m sure not many people would buy a PRS Zach Myers for Jazz-but it great for playing Jazz!! So don’t get caught up on which is better or worst. Experiment;tart with what you think you know until you find the strings that give you the sound “YOU” like. There’s plenty of great on both sides and I really didn’t even talk about “Half-Wounds,” they can be cool too. I took a cue from Joe Pass and Herb Ellis (both of whom I saw play up-close) who both played Medium Gauge stings, with a .013″ first string. The old masters “back in the day” used thick strings for tone! Django Reinhart used thick strings. You especially can hear the difference in Django’s playing compared to the modern Hot Swing/Gypsy Jazz clones, all who are using lighter gauges (creating a thin, wimpy, unauthentic, and overly bendy sound compared to Django). While Django did bend strings, you can tell that he really had to work to do it; and it didn’t happen accidentally, the way it does with so many light-string players. You can hear Howard Roberts’ beefy L-5 swing rhythm sound simply by listening to the television theme song to The Andy Griffith Show. (Yep, you know, the one with “Opie”…!) That is Howard Roberts playing guitar backing-up the whistling on the theme song! While Joe Pass and Herb Ellis were known to play Flat-Wound strings, I use D’Addario XL Nickel Round-Wound model EJ22 Jazz Medium Gauge strings on my L-5 and D’Addario model EJ17 Phosphor Bronze/Medium Round-Wound strings on my acoustic guitars. Both sets use the same gauges [.013, .017, .026(wound), .036, .046, .056]. The wound 3rd-string is a must for an authentic old-school Jazz sound. I recently bought an acoustic guitar set up with “twelves” and really have noticed how wimpy the sound is compared to “thirteens”! I have to admit that the twelves are easier to play, but the loss of tone isn’t worth it! The thirteens aren’t that much harder to play…! I think it is a real testament to ones’ ability to see a player overcome the difficulties of playing thick strings for the pure sake of tone! juststrings.com have the Black Diamonds and can ship to you. $10.30 USD for the Pure Jazz. Their service is excellent, and for those of you who can’t find sets you like, they have a wide variety of single strings so you can make your own sets. No, I have no stock in the company, but have .010 – .046 on an ES-335 with the top three Elixirs, and the bottom three D’addario flatwound, these guys are the only place I can get what I want. How about an on-line string company. Juststrings.com is a very good company that I’ve used many times and should be able to mail any type of string(s) to you. What have yo got to loose. It turns out from this survey I am actually using the most popular type, the D’addario flat wounds. I use 0.13 for the E string, it gives my Ibanez Artcore more tone. You can’t bend strings that much but that’s OK for the version of jazz I am playing. I found on a practical level the flat wounds don’t harbour dirt like the round wounds do…this accelerates the corrosion in my experience. So while the strings are quite pricey they last much longer before they go dull. That said I have an acoustic archtop (The Loar) that does sound better with the round wound strings – it has an improved brightness that you can compensate in an electric archtop to some extent but not in the acoustic. Oh, my beloved Rotosounds Top Tapes flats don’t get a mention. Under-the-radar-monel-goodness! Decent price too. I’ve used both Thomastic swing 12’s and D’adario Chromes on my Gibson ES175 but have recently switched to round wounds for greater versatility. The Chromes do sound somewhat dead after a short while. I will give the half rounds a try since I am also an avid acoutic player and used to round wounds. I would also like to plug a fabulous jazz amp: DV Mark Little Jazz. You will be amazed! 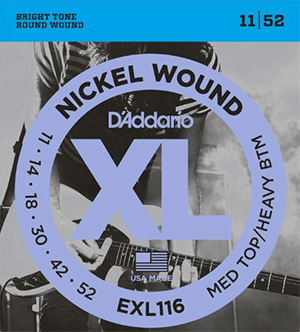 D’Addario EJ21 gauge 12 – 16 – 24w – 32 – 42 – 52 nickel wound. They last the longest for me and the round wound string give the acoustic volume I like vs the flat wound kills acoustic volume. I like the acoustic sound of arch top guitars and it is the base sound to work to get my base sound for the amp and electronics. Tried many different gauges, manufactures, flat and half wounds, but for me this string and gauge works best. 34 years of playing. I use on my ES-135, ECG24 but have the .22 flatwound replaced by .22 plain. I seem to be switching perpetually between .11s and .12s. Thomastik and D’Addario flatwounds both do the job. In Europe, the price difference is less of an issue — in fact, Thomann sells Thomastik for slightly less that D’Addario. But it’s up to the task and the guitar, too. The Epi Emperor Regent I use for comping big band style has .12-.52 roundwound Elixirs (that brand, ’cause I got a box of them to compensate for a bad deal a long time ago.) It’s a lot more acoustic-sounding that way. The most problematic guitar, string-wise, is the Godin 5th Avenue with a P 90. Not happy with the screaming factory roundwounds, I tried both flats and half-rounds on the first week. Settled for the half-rounds just to stop wasting time. In the end, that guitar gets less air time than I expected, although a joy to play. Which strings did you settle on with the Godin 5th avenue? I just brought one & is my first archtop guitar! This has roundwounds on too – the sound is very bright & ‘crunchy’ at the moment. Great! Now do a picks poll! What gauge strings are ‘better’ for people who like to play fingerstyle on a solid body guitar? I use a solid guitar for Jazz and model my sound on Ed Bickert. If you play finger style chord work heavy strings sound dead, especially flatwounds. My advice, use light gauge roundwounds and get a balanced and sweet sound with excellent intonation. I fitted a set of D’Addario half rounds on my Gretsch G5420 and they sounded so fantastic that I bought another set for my Hofner New President, and they were awful! Whereas flatwounds sound wonderful on the Hofner. Definitely depends on the guitar! I have recently acquired a 1960 Guild A150 from a friend who sadly passed away who was quite a renowned and accomplished Jazz player. It hadn’t been played for over 4 years but when plugged in the tone was immense. Quite stunning. I didn’t what make of strings were on it. His widow said he used strings from a red and white packet with a wound G. So I got Ernie Ball’s 11 – 52 Nickel Custom as these seemed to fit the discription. However when I read your review of strings I also got D’Addario EXL 116 which have now been fitted to the Guild. Just got the guitar back and guess what? That immense sound is no longer there. It still sounds great but now I get that squealing sound of my fimgers on the strings as they move. Something that didn’t happen with the old strings. Any recommendations what I need to replace the EXL’s with please? I have a Vintage Les Paul and I put round wound D’Addario EPN 10-46. I keep a warm sound with a lot of versatility. Flatwound would give a sound too dull on this type of guitar. My teacher is a professional and he puts Elixir Nanoweb 10-46 on his Gibson Les Paul. Well, I’ve always used Dean Markley “Regulars (10-46), the equivalent now being their “Vintage” strings, on my Les Pauls (one I use the “Top Heavy” version, which goes to 52), my 355, my Strat and my acoustic guitars; a Martin D-35 and Washburn 10DS. On those I use 12-54 gauge. If I’m ever lucky enough to own a Wes Montgomery L5, I may try flatwounds, but certainly 12-52 gauge. I use Thomastik Jazz BeBop 11-47 on my Telecaster. They give a great sound for the Jazz Classic and especially the Jazz Fusion. I tried before Flat wound D’addario ECG 24, the sound is much too dull. We must take into account that we each have a personal perception of sound. Several factors come into play: Type of guitar, strings, amp and dexterity of our fingers.